Charades is a fun Winter party game - perfect for small or large youth groups, birthday parties, classroom parties and family gatherings. Winter themed Charades is a fun game for all ages - kids, tweens, teenagers and adults. 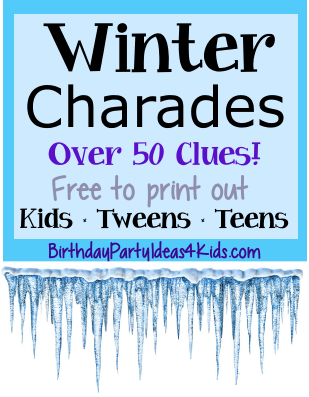 Our Winter Charades party game has over 50 Winter themed clues that are FREE to print out from your next party. All that is needed to play is a group of players and the clues below! Print out the Winter Charades clues and cut into individual clues. Fold the clues so they can't be seen as a player chooses one and place in a container for players to draw from when it's their turn during the game. One player acts out a word or phrase for their team that they draw from a container full of clues. The object of the game is to have the acting players team guess what they are trying to act out using only gestures. There is no talking allowed from the player acting out the clue. This game is easy to play, requires a good imagination and keeps everyone laughing! Charades can be played two different ways - in teams or as a large group. Divide players into 2 teams and have them sit with their team on separate sides of the room. One player is chosen to go first from one of the teams. That player reaches into the clue container (make sure the clues are folded tight so no one can see what they are choosing!) and pulls out a clue to act out. Set a time limit (usually 1 minute) and the player uses that time to act out their clue. Their team players try to guess the word or phrase within the minute limit. Their team can shout out answers until they guess the right answer. If the team guesses the clue within the time limit their team gets a point. If they have not gotten the right answer within the time limit the other team has one chance to answer. If the opposing team guesses correctly they get a point. Book: open hands like a book. Song: silently sing with a pretend microphone. Movie: hold one fist in front of you and circle the other fist in a circle beside it (old fashioned movie camera). Number of words: show one finger per word (for the 1st word hold up 1 finger, for the 2nd word hold up 2 fingers, etc. Rhyming Word: tap ear which means "sounds like." Choose one player to start the game and they act out the clue for everyone. The first person to guess the clue is the next player to act out a clue. Print out clues, separate and fold. Place in draw container for the game. Frozen (movie) Winter is Coming! over 50 fun winter themed clues to print out! over 50 Christmas themed clues to print out! over 50 unique Christmas pictionary clues!